Image Credit & Copyright: Richard S. Wright Jr. Explanation: Interstellar dust clouds and bright nebulae abound in the fertile constellation of Orion. 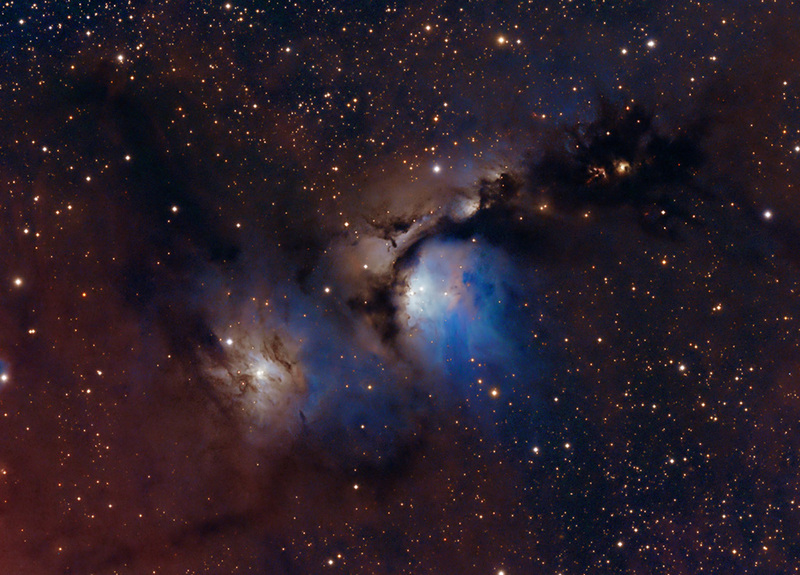 One of the brightest, M78, is near the center in this colorful telescopic view, covering an area north of Orion’s belt. At a distance of about 1,500 light-years, the bluish nebula itself is about 5 light-years across. Its blue tint is due to dust preferentially reflecting the blue light of hot, young stars in the region. Dark dust lanes and other nebulae can easily be traced through the gorgeous skyscape that includes many Herbig- Haro objects, energetic jets from stars in the process of formation. But missing from this image is McNeil’s nebula. A major discovery only recognized in 2004, the enigmatic, variable nebula was found along the dark lane of dust above and right of larger M78. McNeil’s nebula is associated with a protostar and seen to be sometimes present and sometimes absent in photos of the well-imaged region. McNeil’s nebula faded from view late last year and is still absent in this deep image recorded in February 2019.